FDA has ticked off the E-Sisters again. That's the informal name given to the Essure Problems patient advocacy group, which has been fighting for years to get the controversial birth control device off the market. In a statement released March 7, FDA Commissioner Scott Gottlieb updated the public on the agency's postmarket review of the device, which is now sold by Bayer. Gottlieb said the agency received nearly 12,000 medical device reports for Essure in 2017, the majority of which were received just in the last quarter of the year. Most of this new information comes from cases that were made available by plaintiff attorneys as part of litigation against Bayer, and Gottlieb said the agency is trying to find out if these are new safety concerns or if they have been reported in a prior safety filing. More than 90% of the 2017 reports mentioned issues involving potential device removal, which he said the agency is also further investigating. FDA added a boxed warning to Essure in 2016 and ordered Bayer to run a new postmarket surveillance study on the device, as well as provide a patient decision checklist to ensure that women considering the permanent birth control option were fully informed of the procedure's risks and benefits. Activists argued at the time that these actions were not enough. "Last month I had the opportunity to meet with consumers who have been affected by the medical device Essure to listen and learn about their concerns," Gottlieb said, noting that roughly 750,000 women have been implanted with the permanent birth control device. "Some of the women I spoke to went on to develop significant medical problems that they ascribe to their use of the product. As a physician, I know that patients are uniquely positioned to provide feedback to the FDA about their experiences with currently available medical products, and I appreciated the thoughtful discussion. Ensuring the safety and effectiveness of medical products is paramount to the FDA and a core part of our consumer protection role. The FDA takes concerns about Essure very seriously." According to a Reuters report, Bayer spokeswoman Courtney Mallon said the number of Essure medical device reports that are not related to litigation is declining, while litigation-related reports are dramatically increasing. Bayer noted in its 2017 financial report that, as of Jan. 30, 2018, it had been served U.S. lawsuits from about 16,100 Essure patients and two lawsuits in Canada. The company said it anticipates additional lawsuits. To say that the E-Sisters were not impressed with the commissioner's words might be an understatement. 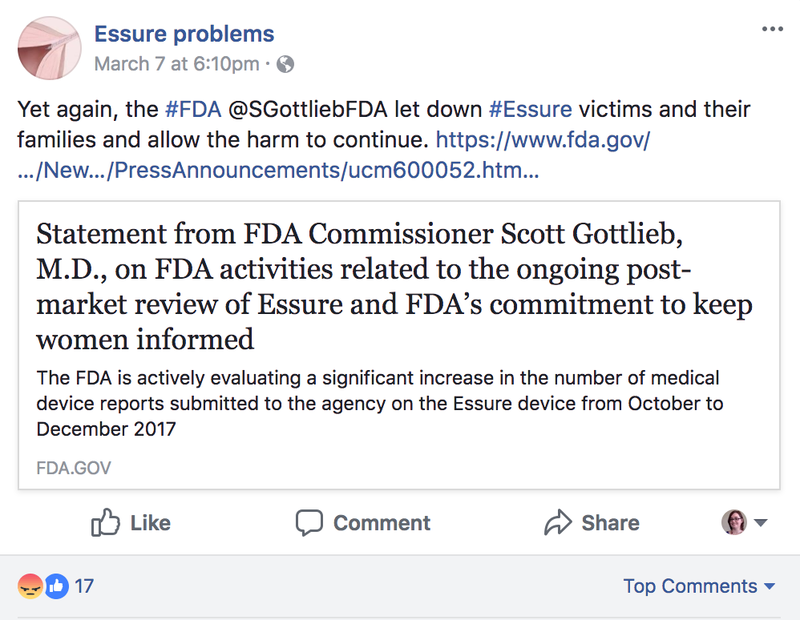 The group posted the statement to its Facebook page and commented that Commissioner Gottlieb let down Essure victims and their families by allowing the harm to continue. MD+DI asked the group to elaborate on why it considered the statement a letdown. Although the group did not directly reply, it promptly posted a statement from Holly Kelly Ennis, a partner at the law firm Ennis & Ennis, that addressed the issue. "Commissioner Scott Gottlieb penned an industry-friendly response attempting to justify the weak actions taken by the FDA," Ennis said. She took issue with the number of patients cited by FDA's statement because Bayer has used that number, 750,000, for five years and has said that it refers to the number of devices sold, not necessarily the number implanted. "Many women were implanted with multiple devices, many kits are still sitting on shelves, and other kits have likely expired," Ennis said. "Accordingly, neither Bayer nor the FDA has any idea of how many women were actually implanted with Essure, making all data collected inaccurate as the baseline number of women implanted has not been determined." Ennis also noted that the patients who met with Gottlieb and his staff last month explained that many doctors are "blatantly refusing to inform the patients concerning the black box warning or go over the patient decision checklist." She said that out of 517 women who have joined the Essure Problems Facebook group since the box warning was implemented, 506 say they never received the warning, nor was the patient decision checklist discussed. As for the post-market study, Ennis raised concern that the results may be influenced by physician bias. "Does it seem reasonable for the company making a profit from the manufacture and sales of the device to undertake, run and control a post-market study on the safety of the device? Are we truly expecting the results of the post-market study run by physicians paid by Bayer who already have a financial stake from implanting the device to fully portray the potential problems caused by the device?" She said. Ennis also noted that the study is not scheduled to be completed until 2023, and she argued that the device should be suspended from the market pending the outcome of the current trials.